Arch Address Plaque with Monogram Wall Mount - - acanthus monogram personalized address sign. 14" x 11.25" holds a single initial and a two-line address. Wall mount. Made in USA. 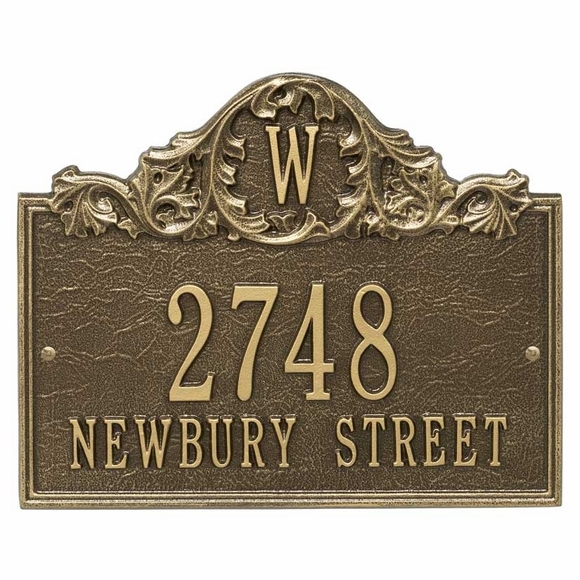 Decorative address sign features a single-letter monogram surrounded by classic acanthus foliage. A double border accents both sides and the lower edge. Line 1 holds up to five (5) 3" characters. Line 2 holds up to fourteen (14) 1.25" characters. Colors: AB antique brass, AC antique copper, BG black/gold, BV bronze verde, OB oil rubbed bronze, OG bronze/gold, PS pewter/silver. Large image color is antique brass. Smaller images colors (from left to right) are antique copper, black/gold, bronze verde, oil rubbed bronze, bronze/gold, and pewter/silver. Dimensions: 14" x 11.25" x .25". Acanthus arch plaque with a one letter monogram and address. Fast shipping. Great design and craftsmanship. This was an excellent purchase!!! Item arrive packaged well and on time. Wonderful quality of the piece exceeded my expectations. It is a wonderful addition to the front of my home. I buy these address plaques for my clients after we close escrow on a new house. It gives the house a nice personal touch and really stands out. I think they are well made and everyone always is so excited and LOVES the address plaques. It is a nice finishing touch to any home.